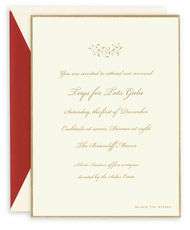 Celebrate a special event with this elegant invitation with a simulated gold sparkle border. Card size is 5.5" x 8.5". Printed return address in flat black ink available. Imprint is flat.. This Red Frame Invitation is the perfect way to announce your party or special event in style.Blank white envelopes are included. Invitation size is 5.6" x 8.5". Printed return address is.. 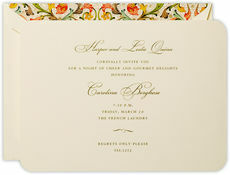 Celebrate a special event with this elegant invitation with a gold designed border. Matching blank envelopes are included. Invitation size is 5.6" x 8.5". 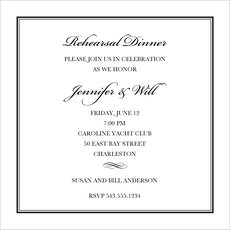 Printed return address in flat..
Like pillbox hats and peep toe heels, we love the romantic nostalgia for eras past that this delicately calligraphed invitation boasting rounded corners evokes. Size 7.5" x 5.5". Matching blank.. 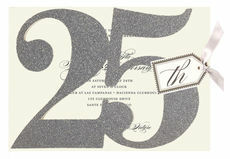 These invitations feature glittered die-cut 25th card stock attached to printed invitations secured with satin ribbons. Invitation measures 7" x 5" . Invitations, envelopes, diecuts and.. 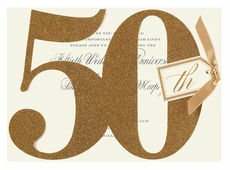 These invitations feature glittered die-cut 50th card stock attached to printed invitations secured with satin ribbons. Invitation measures 7" x 5" . Invitations, envelopes, diecuts and.. These invitations feature printed invitations on ivory cards placed in a Fern Branch with gold foil accents die-cut frames. Assembled Invitations measure 5.25" x 7.75", printed invitations..
Set of 25 flat printed invitations in the ink color of your choice. Size 5" x 7". Envelopes included. 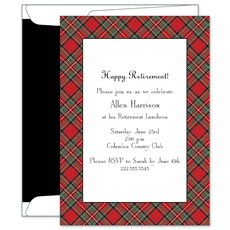 Printed return address and optional envelope lining available on envelopes. Your choice.. 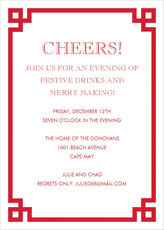 Spread the holiday cheer with this set of holiday invitations. 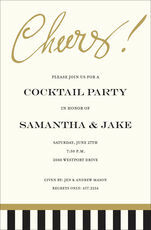 Set of flat printed invitations in the your choice of ink color and typestyles. Size 5" x 7". Matching blank envelopes..
this set of timeless yet simple gold bordered invitations is suitable for any type of event, from a small home gathering to a grand ballroom affair. Size 5.5" x 7.5". Matching blank envelopes.. 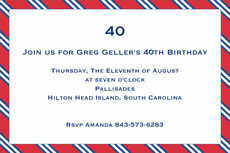 Celebrate a your special event with this invitation with a blue border. Matching blank envelopes are included. Invitation size is 5.5" x 8.5". Printed return address in flat black ink is.. 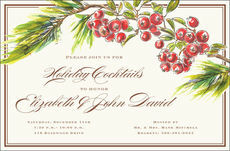 This invitation is full of classic holiday elegance perfect for an event with sophisticated holiday flair. 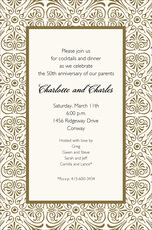 This set of invitations are flat printed on cream colored stock in your choice of .. Spread the holiday cheer with this set of holiday invitations. 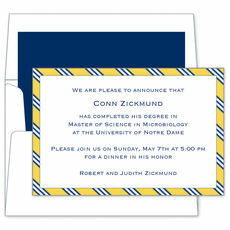 Set of flat printed invitations in the your choice of ink color. Size 5" x 7". Matching blank envelopes included. Printed.. 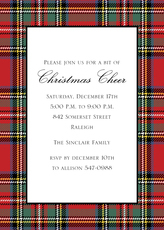 These invitations feature printed invitations tucked into matte green holly leaf diecut frames. 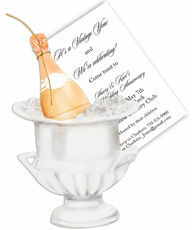 Assembled invitation size is 5.75" x 9". 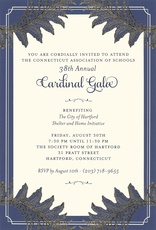 Printed invitation size is 3.875" x..
A tasteful choice for your corporate invitations sends a subtle but powerful message about your company to employees and clients alike. Whether your event is an end-of-year company party for employees or an exclusive benefit dinner for valued clients, the invitations you send out are the first glimpse your guests get of what's to come. Our large selection of styles and colors makes it easy to find the perfect look to represent your event and your corporate message. Little details including custom colors and fun extras let you make these corporate invitations your own. You can personalize your invitation to match your brand with customizable options like ink and paper color, font style, embellishments and more. Paired with matching envelopes, this selection of invitations adds a welcoming atmosphere of dignity and formality to your corporate correspondence. 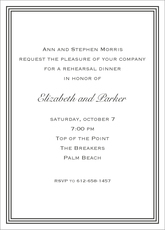 Frame-style invitations set off your custom text with a distinctive border that highlights and complements your message. Corporate invitations framed by borders are as simple or sophisticated as you want, and you can put your own unique finishing touches on it with seasonal colors, metallic foil embellishment, embossed text and more. Whatever the occasion, the clean and elegant look of a bordered invitation is an eye-catching and inviting way to remind your guests to save the date. 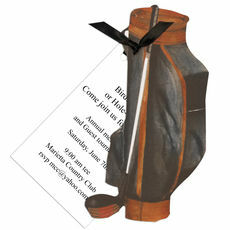 We even offer a selection of die-cut invitations in unique shapes to bring a touch of fun to your special event. These standout invitations are a memorable way to make sure that employees and clients alike will be excited for your next corporate event.